With just two crime fiction novel releases under her belt, Alex Marwood has positioned herself as one of the leading tastemakers of the genre. This week, her third psychological suspense novel, The Darkest Secret, was released in the United Kingdom and it will further propel her to the forefront of contemporary crime writing. Like her two previous books, The Darkest Secret features everyday folk caught up in unlikely, but completely realistic, situations. The characters Alex Marwood writes about could easily be your neighbors, your friends, or even you, yourself. It is this ordinariness and familiarity which raises the level of suspense for the reader. The Darkest Secret tells its tale by alternating between two distinct time-periods. The first, and arguably most important, is August of 2004. On a holiday weekend, Sean Jackson is celebrating his fiftieth birthday at his beach home with a gathering of his closest family and friends. Among the guests are his children – two older girls from his previous marriage and a set of three-year-old twin girls from his current relationship. Also in attendance are his colleagues, his friends, a lover, and more than one person with an axe to grind. Sometime during that weekend celebration one of the twins, Coco Jackson, vanishes – spurring what will become a decade long mystery. The time-period for the other section of the story is twelve years later, the weekend of Sean Jackson’s funeral. The major focus of this section is a spontaneous road trip to the funeral made by Coco’s twin sister Ruby and one of her older half-sisters, Camilla. As they work through their strained relationship, they discuss the events of that summer in 2004 realizing that not everything is adding up the way they original believed. In an intricately structured narrative, Alex Marwood allows various members of the assembled group to dole out the complex story in small doses. Each character only knows a portion of what really happened and thus it falls to the reader to slowly piece together the critical events which occurred at the beach house. Like the sand on which the young girls are last seen frolicking, the shifting loyalties within the assemblage are unstable at best and just possibly on the verge of complete collapse. Each new grain of truth alters the balance only to be offset once again by yet another small nugget of the story. The reader’s allegiance will sway as often as the ocean breeze blows. Alex Marwood’s characters in this new novel are not easy to root for. In many ways, these people reflect the parts of ourselves that we like the least. The Darkest Secret is not a novel for those who prefer good and evil to be easily separated and clearly defined. It is precisely because each of the people involved is flawed in their own way that the actions of that fateful summer were able to occur in the manner in which they did. And as readers begin to suspect the truth of what happened and who was responsible, the more difficult it is to accept. 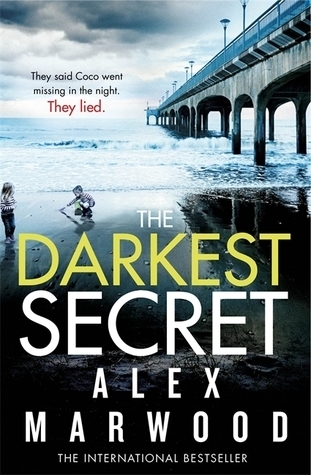 The Darkest Secret is without a doubt Alex Marwood’s best novel to date. Only days into the new year, we already have what is sure to be one of the most talked about books of 2016. The truly thrilling part is that Marwood still has many tales to tell and she just keeps getting better with each new release. What a great review of a terrific novel. You’ve summed it up quite well. I agree with you that Alex Marwood is one of the ‘leading tastmakers” I particularly love that the 3 novels are so different in tone, pacing, humor, style, and subject. Alex Marwood is truly a creative writer! Thanks for stopping by Janet. We’ll be discussing Alex’s work for many years to come.